Where is God on the Streets? As part of your preparations for Ordination training, you are advised to lay some things aside – at least for the duration of your training – and it’s one of the things that I am finding it difficult to decide about. Having spent the last couple of years actively increasing my ministry – I now have to review everything and push to one side the feeling of guilt that some things will have to be relinquished. There is one thing however, that I hope very much to continue with. 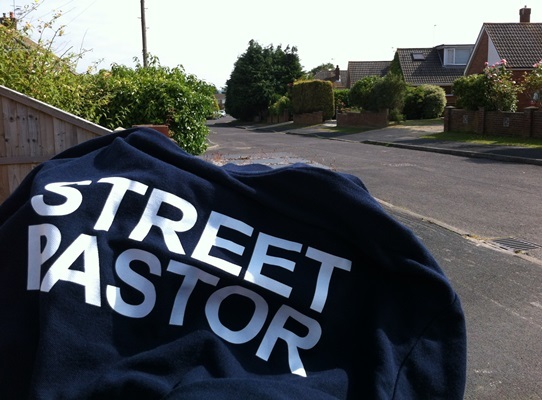 As a firm believer that God is not just found in Sunday worship but is found wherever Christians reach out into their communities, my work with the Street Pastors has proved this time and time again. There are also sound theological reasons for doing it as well. In 2012, Paul Rowlinson, a Street Pastor in Bangor, spoke about the work he and his colleagues were doing. He commented that “Street Pastor’s doesn’t have any particular theological or social standpoint. We are there to offer pastoral care and practical help and to listen to people. We are not out there to preach or anything like that.” As a Southampton Street Pastor, I would generally agree with this overview. However, I would argue that many facets of theological thinking are demonstrated in abundance within the work of Street Pastors. At its heart, the work is both pastoral and practical. The people that a Street Pastor meets on patrol are usually at their most vulnerable. The homeless man sitting in a shop doorway, who for one reason or another didn’t get an overnight hostel place, needs a drink of hot chocolate (and maybe a biscuit for his dog) before making his way to the multi-storey car park to find a hidden corner in which he can feel safer than sleeping in the open. The nightclub reveller who, having been thrown out of the establishment which earlier sold her bargain 50p vodka shots, wending her unsteady way barefooted on the glass littered and vomit splattered pavements, needs a pair of flip-flops. The young man slumped down on the frozen floor, and who proceeds to empty the contents of his stomach, not quite over my shoes, needs a space blanket and his face wiped. Practical theology in practice? Street Pastors see what is going on, know why this is, what ought to be happening and respond to it. As they become better known in the community they gain credibility. People know that the Church is there for them in a practical yet unconditional way. As MP David Burrowes put it “Street Pastors is about Christians rolling up their sleeves and getting involved in practically responding to the problems of crime and safety.” God becomes known in our actions; a modern day application of the Good Samaritan parable. Practical theology answers the how, but what about the why? We should remember that people who become Street Pastors are not there as government employed social workers. They are Christians willing to give their time as part of their mission, or Missio Dei – ‘sending of God’ and instituted by Jesus, first to his disciples (Matthew 10:1) then to a larger group (Luke 10:1-4, 9) This type of work puts into practice many strands of Mission theology including sociology, communication and ecumenics. Coats, caps and rucksacks declaring in ‘Hi Vis’ letters the fact that we are ‘pastors’ – not police – not medics – prompts the inevitable questions. What is a pastor? Why would you do this? This is our chance to ‘evangelise’ in the gentlest of terms. “We’re from local churches and we’re here to help people; to keep you safe. We do it because we believe we’re called to do it”. Sometimes the discussions go deeper and give people opportunities to explore their own theological wonderings and experiences. It’s then that the Holy Spirit seems to appear, in these five minute ‘chats’. Phoning back as each encounter arises, develops and concludes enables the Prayer Pastors to pray ‘into’ the situation, underlining the fact that we are not dependent on our own strengths and skills but need the intercession of Christ and the Grace of God. Where is God on the streets? He’s wherever he sends Street Pastors! This entry was posted in Ministry and tagged BAP, christian, communites, God, ordination, religion, Street Pastors, streets, theology, worship on July 12, 2013 by lindasgalvin.